The Coventry Sewing Machine Co. was set up in King Street, Cheylesmore, Coventry, c1859 by James Starley and Josiah Turner to import and market sewing machines from America. Later they manufactured their own sewing machines and changed the name to The Coventry Machinists Co. 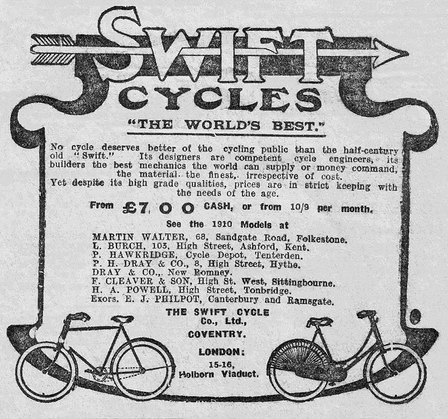 In 1869 they started to manufacture velocipedes, bicycles, tricycles and quadricycles and became the second largest cycle maker in Great Britain under the name of the Swift Cycle Co. 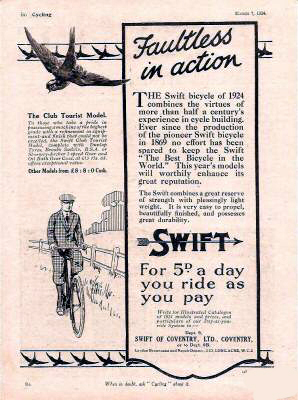 They produced a vast range of these machines, one model being named the “Swift” and another the “Club” as many cycle clubs were being set up at that time. In 1898 they produced their first motor cycle and a motor tricycle. The first prototype car was made in 1900 which went into production in1901. It had a tubular chassis, a single cylinder de Dion engine and a two-speed back axle. The Swift Motor Co. was formed in 1902 and produced one, two, three and four-cylinder cars, first using proprietary engines up to about 1907 and then those designed by their Works Engineer, William Radford, which were made in their own factory. During the early 1900′s Swift entered their cars in reliability trials and won many gold medals. Up to 1915 several models were produced each year. During the First World War the factory produced munitions, Renault and Hispano-Suiza aircraft engines, military bicycles and other war equipment. In 1919 the Company joined the ill-fated Harper-Bean organisation and changed its name to Swift of Coventry Ltd. Production was then concentrated on the four-cylinder 10hp and 12hp models which were renowned for their reliability. Although Swifts had their faithful followers, by the late 1920′s their hand-built cars could not compete with the mass-production methods of Morris, Austin, and Ford, whose similar cars sold for only half the price of Swifts. In spite of producing a cheaper 8hp model, the Cadet, with a Coventry Climax engine and a centre-change three-speed gear box in late 1930, this was insufficient to save the Company and the factory closed its doors for the last time in April 1931. With such a distinguished place in cycling history, the Swift Cycle Co produced distinctive bicycles, the main identifying features including a chainwheel spelling out ‘SWIFT’ and unique ‘S’ lamp bracket. The more expensive models also sported duplex forks, generally considered the ‘preserve’ of top manufacturers such as Humber and Centaur. Sunbeams and BSA’s of this era are sought-after but not rare, whereas a Swift Gent’s Roadster is now one of the rarest upmarket machines of this time. Q. What is the difference between bicycles made by the top manufacturers and cheaper brands? Why pay more for a Sunbeam, BSA, Triumph, Humber …or Swift? A. Customers asked this question at the time, and you may ask the same question now, wondering why bikes such as this are so much more expensive than, for example, a bike such as a Hercules or Raleigh. The answer is that these machines are so much more pleasurable to ride. Also, their components, being manufactured exclusively by the companies themselves, were made to the highest standards, and require much less maintenance. It’s the same as comparing a Rolls Royce or Bentley with a Ford or Austin. Then, as now, you get what you pay for. This 89-year-old Gent’s Swift Roadster is in excellent original unrestored condition. The celluloid handlebars and Swift chainwheel are particularly attractive on this very rare machine. Although cosmetically untouched, it has been recently serviced, with new tyres and tubes fitted, and is ready to ride.